The Shasta Daisy is a favorite among landscapers because its simplicity and eye appeal are at home in any environment. The Leucanthemum x superbum, commonly known as the Shasta Daisy, has beautiful, bright white petals surrounding a golden yellow center. These showy flowers grow best in zones five to nine with full sun and medium to dry soil. From July to September this low maintenance plant will bloom, reaching 12 to 18 inches in height and 9 to 12 inches in spread. As a long-lasting summer perennial, Shasta Daisies are frequently used in gardens and borders, attracting butterflies to the area. If you're growing from seed, expect blooms the second season. This pretty plant has no serious insect or disease problems, making it a great investment. The Shasta Daisy is similar to the roadside wildflower that dots American fields and roadsides, but it has been bred to consistently return and multiply every year while producing more abundant, more vibrant blooms. Each plant produces clumps of multiple stems that grow to a height of 2-3 feet and will span 2 feet across. Each stem features thick, dark green foliage and is topped with a flower featuring a bright yellow round center surrounded by a row of white petals. Hardy in zones 5-8, the Shasta Daisy prefers full sun but will tolerate partial shade. It will grow in almost any soil condition but thrives in well-drained loam. Planted in the spring, Shasta Daisies will reward gardeners with flowers from late spring through early fall. Removing spent blooms encourage more to grow and cutting flowers will only help the plants spread. The tall blooms make an excellent rear border for a mixed flower garden, and they bring a rustic simplicity to areas along walkways and fences. The Shasta Daisy may not be the same as a roadside cousin, but it will bring naturalized beauty to any setting and can even be grown in containers for portable appeal. Shasta Daisy is very low-maintenance beauties are a must for novice gardeners, and children will appreciate the butterflies they attract as well as having flowers to cut to surprise visitors. The Shasta Daisy is merely a Can't-do-without favorite that will continue to add charm to its surroundings for years to come. The flowers will show in the summer months to early fall. This bulb can be cut and placed into vases and brought indoors lasting about ten days. This plant can be used to treat cuts and wounds, aid in colds or to treat worms in children. The juice from the plant has also been known to make ear drops for earaches. 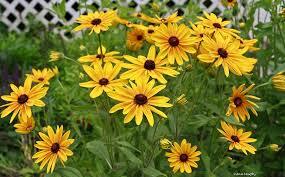 The flowers can grow up to 4 inches in diameter and have a small disc or circle in the middle that is brown. The blooms will appear in the later part of the summer and into the fall months. Cross breeding this plant has produced many colors which include red, orange and brown. This plant looks well planted in flower beds or along driveways or walkways. This plant cut fresh makes for a great floral arrangement. The perennial has a green stem with a flower that rests on top. Shasta Daisy is a common perennial that is found almost anywhere. 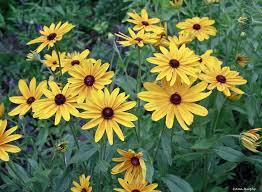 Other common names are the Black Eyed Susan. The Shasta Daisy is a quite simple flower but known for its elegance. The center is brown and fuzzy, with small yellow leaves around the outside. The stem is slender, light green and sits upright with its bloom that rests on top. This perennial blooms from summer to early fall. This is a small perennial, and they love shady areas with moist soil.